After the holidays are wrapped up and the trees are put away the house can feel sparse and chilly without all that twinkle light magic that filled the house. 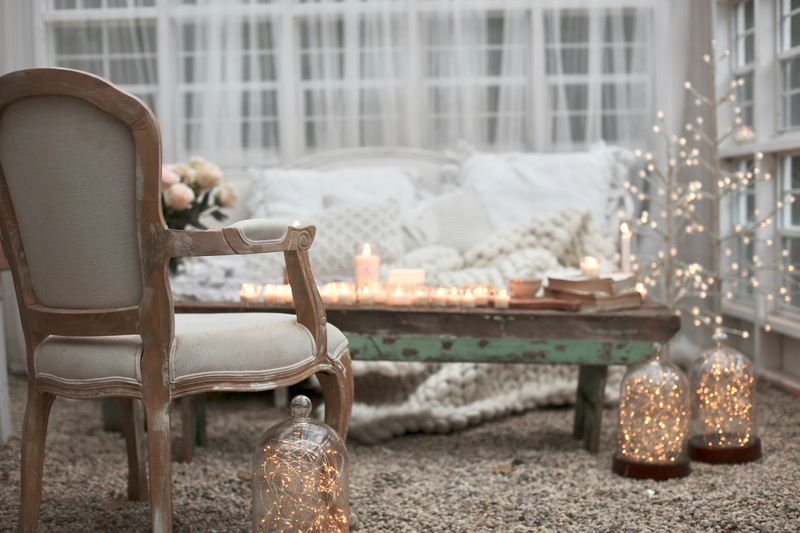 So how do you decorate and warm up your home in those winter months before spring arrives? 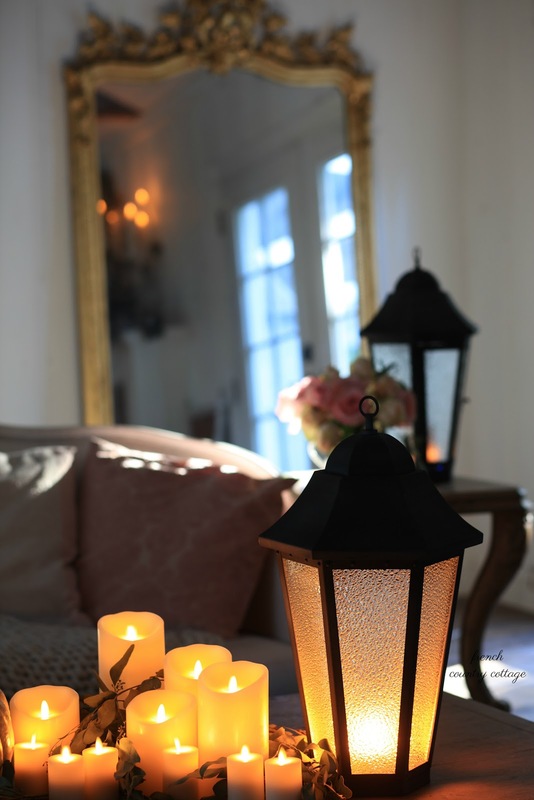 I am sharing a few ideas for adding warmth and ambiance to your home in winter, and it is easier than you think with just a few elements. Of course one of the first things that comes to mind for warming up any room or setting are candles—like these amazing LED candles. That flicker adds a ton of charm and cozy anywhere you place them. 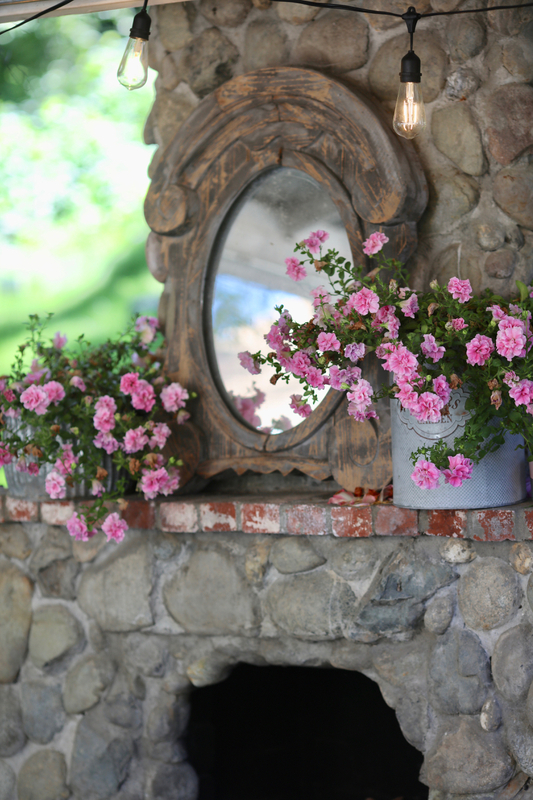 I love to stack them on the mantel, inside the firebox if it isn’t a functioning fireplace or group them on a coffee table or bench. or tiny little twinkle strands intertwined in a stack of logs, a basket, or even tucked inside a cloche—those lights add a bit of magic and help warm up your space. Something else that works beautifully to fill a corner with a bit of twinkle without feeling like Christmas are those magical little winter trees. Spindly birch and LED trees can be perfect for warming up your room, and you can place them anywhere you would like a little bit of ambiance. 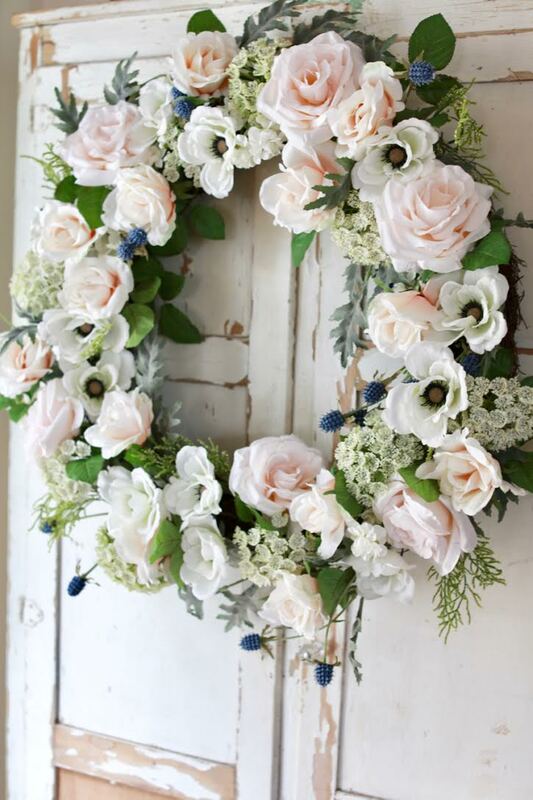 Simple and always charming, a pretty wreath can be used in so many places. 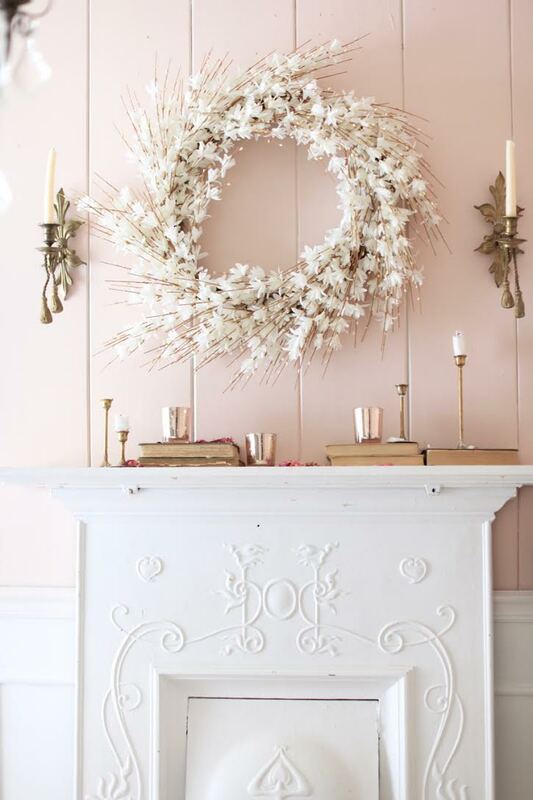 I love to place them above the fireplace mantel—this white forsythia wreath is subtle in color and adds a touch of elegance. 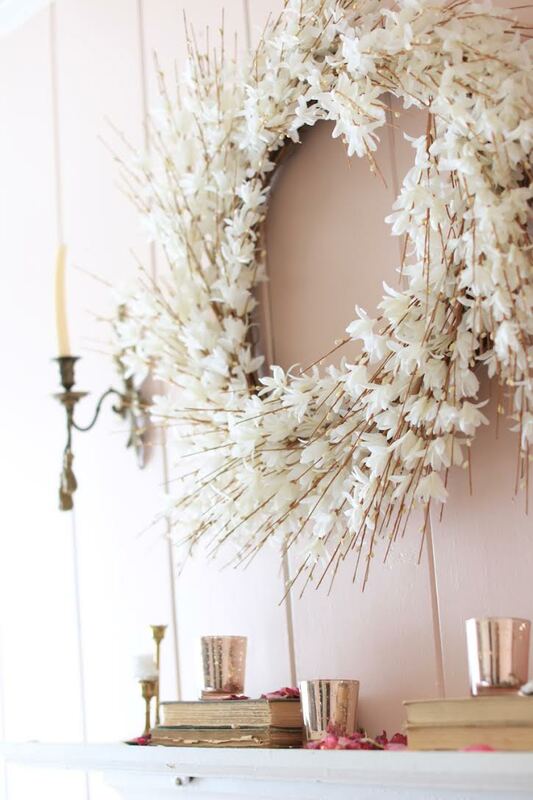 You can also use them on cupboard doors for an unexpected touch—the Chantilly wreath is a perfect addition. 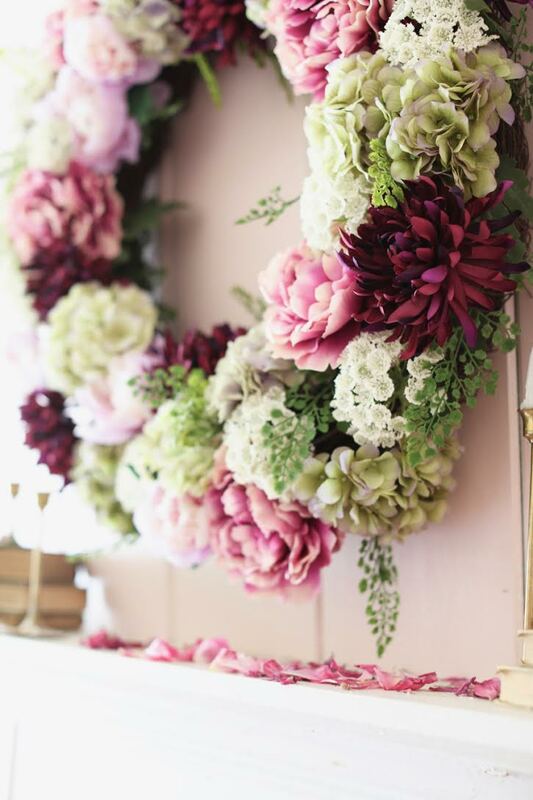 And for a pop of color anywhere, I love this purple peony wreath. The colors provide a burst of sunshine to a winter room, and for an interesting touch simply add a few dried petals. 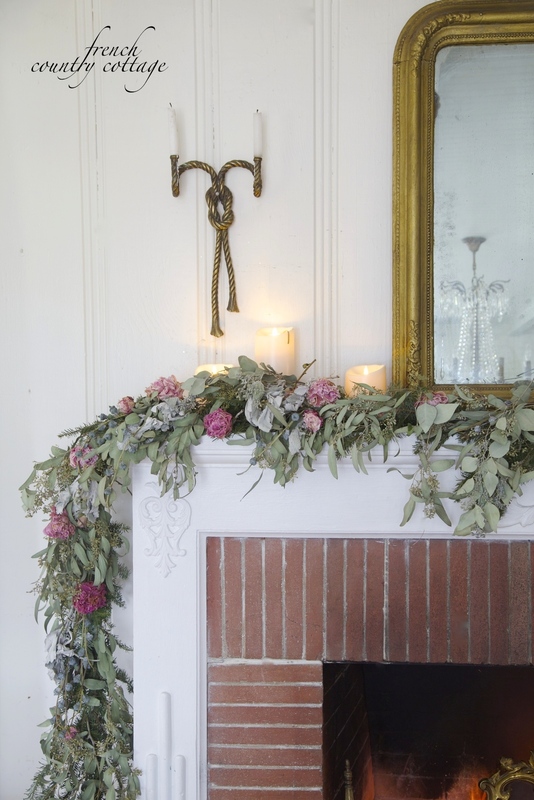 Garlands are often thought of as winter and holiday decor, but they can be used year-round to add a layer of cozy. Think of places like the sideboard, an armoire, or even down the center of your dining table to make it feel more like spring. And something I did one year with a holiday garland after Christmas was to add a few dried flowers and sprigs of eucalyptus and leave it in place. It was a warm, welcoming look all through winter. 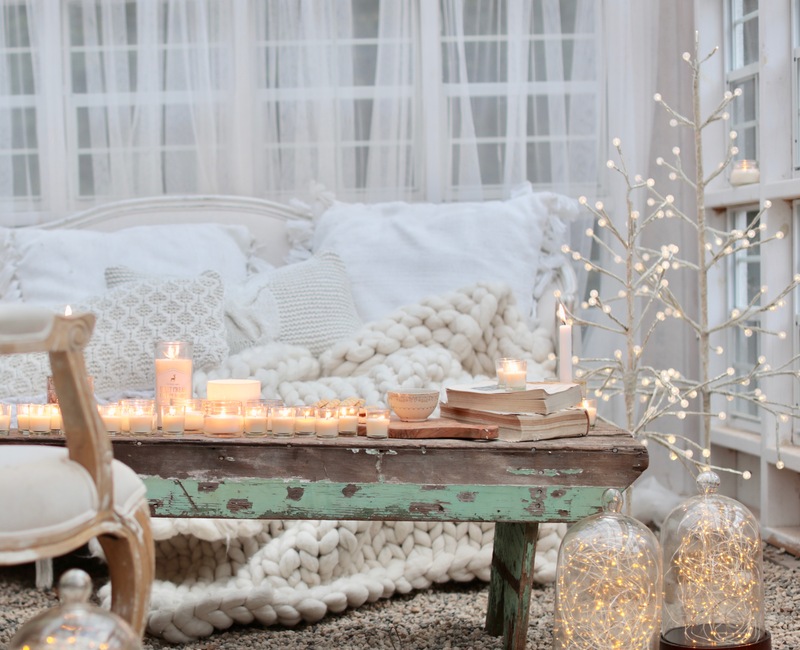 Your rooms don’t have to feel stark or cold during winter. Simply bring out those chunky throws, and add ambiance with lights and flickering candles to help create that cozy “hygge” feeling all winter long. For more ideas on how to start transitioning your home decor from winter to spring, check out this post. 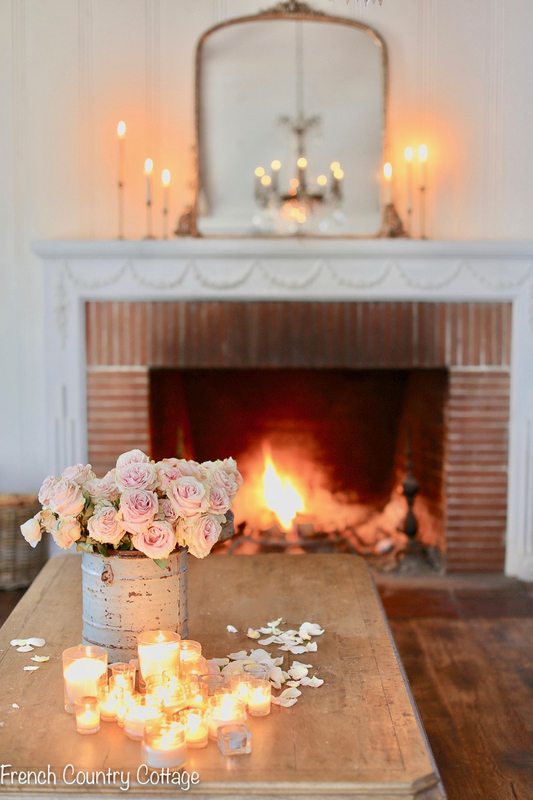 Courtney writes the blog French Country Cottage where she shares lifestyle & design inspiration and the ongoing renovations of her 1940's cottage. I really like the LED candles because they are so safe! Hi, I’m yvon and I love your great post! I think the most of us getting rid of the wreaths after the holidays, but I do agree with you that wreaths are a great way of adding some sphere and colour to our interior!